Peregrine falcon nesting season is here! 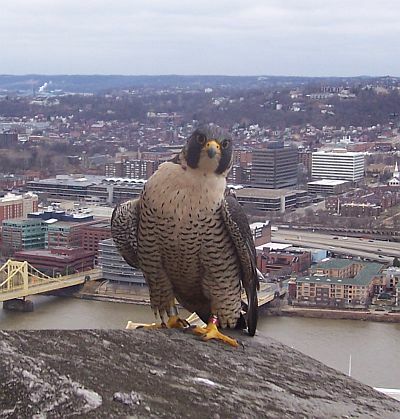 This morning Todd Katzner, of the National Aviary, placed a webcam near Tasha and Louie’s nest at the Gulf Tower in downtown Pittsburgh. As you can see, Tasha was there and she wasn’t happy! “Don’t mess with my nest!” she says. The webcams will soon be live on the Aviary’s website. I’ll let you know when they’re up. What a fabulous photo!! Seeing the look on her face makes me laugh. I have learned so much about these birds the past few days and I absolutely love them. I can’t wait until the web cams are up. I look forward to watching their progress. Spring can’t be far away…..I so look forward to watching the web cams of the falcons’ nest and watching the babies grow. Thanks to you for your website and to the Aviary for making it all possible.